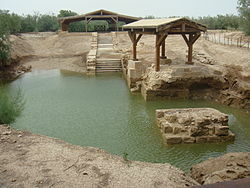 Situated on the eastern bank of the River Jordan, nine kilometres north of the Dead Sea, the archaeological site consists of two distinct areas: Tell Al-Kharrar, also known as Jabal Mar-Elias (Elijah's Hill) and the area of the churches of Saint John the Baptist near the river. Situated in a pristine natural environment the site is believed to be the location where Jesus of Nazareth was baptized by John the Baptist. It features Roman and Byzantine remains including churches and chapels, a monastery, caves that have been used by hermits and pools in which baptisms were celebrated, testifying to the religious character of the place. The site is a Christian place of pilgrimage. This article uses material from UNESCO World Heritage List article "Bethabara", which is released under the Creative Commons Attribution-Share-Alike 3.0 IGO License.